Whenever you think about Rajasthan, lots of colors flashes in front of you as Rajasthan possess a very colorful community full of their traditional value. 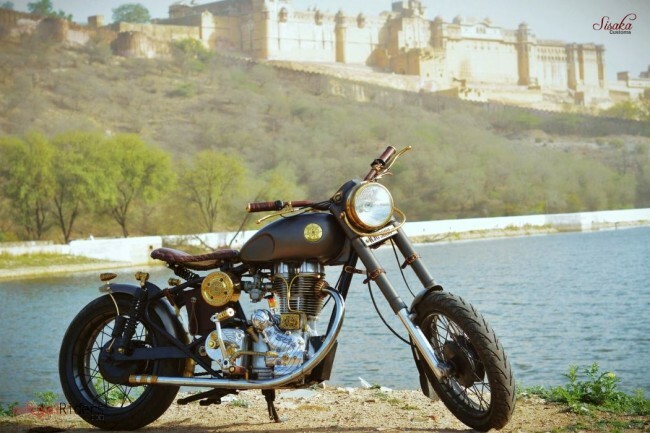 And when one such tradition combines with one of the oldest motorcycle legacy then you get Thorn – A custom Royal Enfield created by Sisaka Custom Motorcycle – Jaipur. Though whole India is known for preservation of traditional value and styles, but as said Rajasthan holds up a special place. 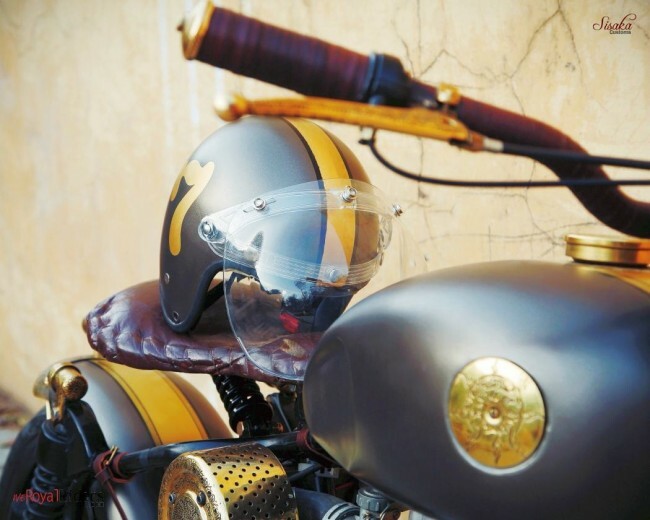 And when you first look at this customized bike by Chetan Yadav of Sisaka Custom, you will instantly notice to level of customization with traditional Indian touch using lots of bronze and copper which is deployed in this bike. 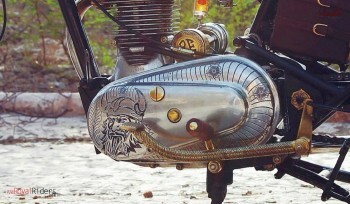 The more you look at the bike, you will realize how much attention has been paid to every component and part. 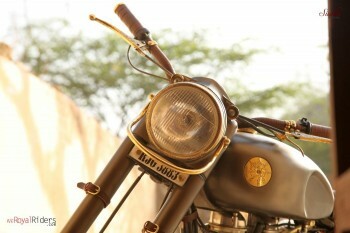 Above all, the theme of the bike maintains the authenticity of a Royal Enfield, I would rather say that makes it even more Royal. 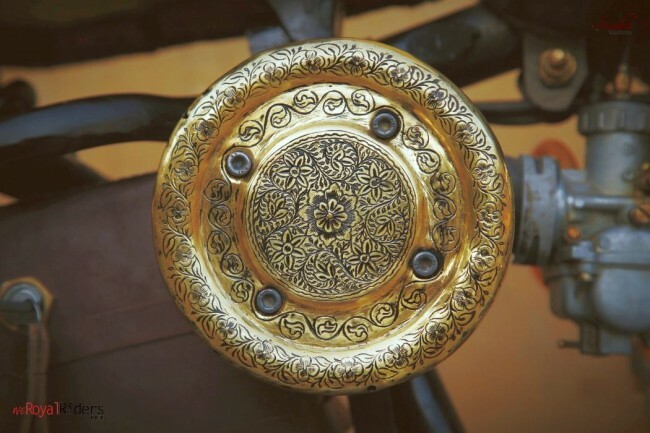 In this bike you will find traditional art engraving on metals throughout and in abundance which gives its own unique style and stands it out from the other customizers and setting up his own space. 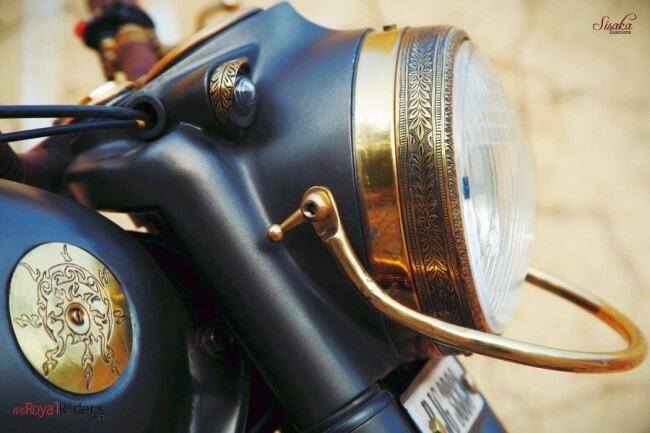 The first thing you will notice is the use of so much brass, a golden appearance with royalish presence and the half ring arch in front of headlight. I don’t know what exactly to call it but this is prominent to be noticed and it looks like as if used to tame this bull. Stylishly used rear fender with brash plate. 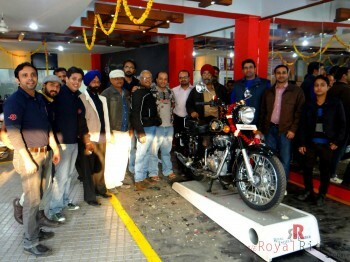 Maintains the authenticity of Royal Enfield. The bike has extended front suspension which gives it even better instance. The bike deploys a custom fabricated 18 liter fuel tank which flows nicely with the bike. It has fabricated tool box, ofcourse custom saddle which as per Chetan are the modest but comfortable enhancement to in riding of this bike. 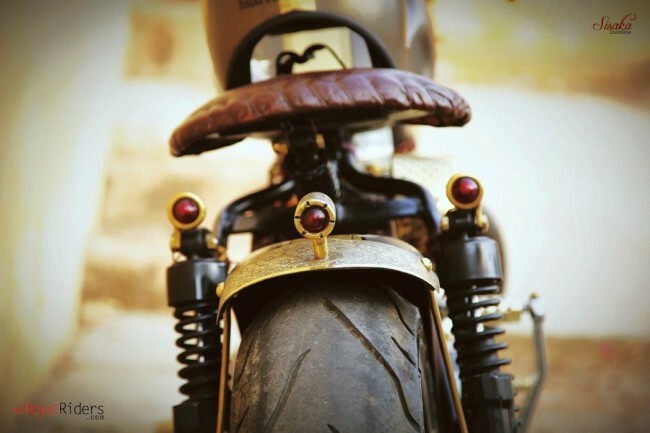 The bike has lots of custom fabricated parts and list includes stretched soft tail, brass tail-light/plate bracket, brass foot peg, Brass levers, rear mudguard and stays, leather Seat, air Filter cover, chain tensioner, head hight brass ring , Enfield silencer pipe with brass engraving. The bike has its wires and electrical so much changed that starter key of the bike is in toolbox now. 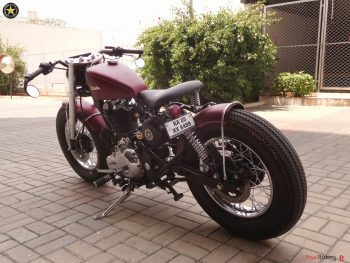 Further, the foot-peg placement has not been changed in the bike as they wanted to create something authentic and unique while still maintaining the essence of a Royal Enfield with their limited budget. Custom fuel tank with engraved brass plate. 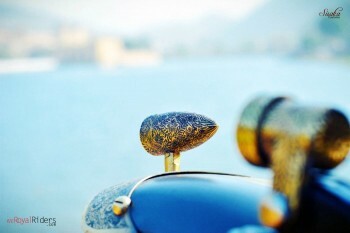 The beautiful air filter with traditional brass engraving. They have also resprocket engine and have redone it with High Compression Piston rings for better performance. The filter is stock RE with Mikarb’s carburetor. During building process of this bike, Chetan says that they faced many issues and setbacks with electrical problems, body line etc, had to fabricate all these parts again and again till the time it completely satisfy safety and usability. The extended front fork gives it a unique instance. The unique engraving is everywhere. 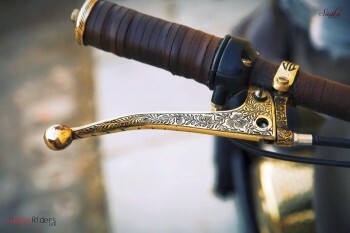 Beautifully custom crafted and levers. 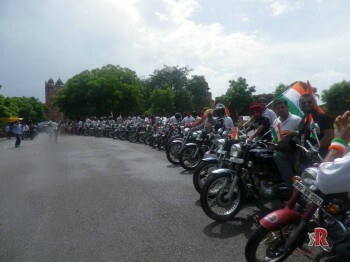 When asked about his inspiration then Chetan answered, “I was always mesmerized by the motorcycles. My fathers used to have one vintage Enfield but never let me ride that. I used to ride it secretely in the nights when everyone was sleeping. One day, I was caught by my mother and my dad came to know about it and surprisingly he gave me that motorcycle. It was my first Enfield. 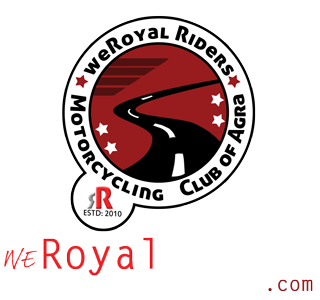 I am in love with motorcycles and I think that its the main reason why I have started this venture”. He further adds that all he has done what he wanted to do, taking inspiration from his favourite builder and voice of heart, you see this bike as the final product. The bike uses wider rear wheel with custom swing arm to accommodate it firmly and the handlebar is also wrapped with leather which flows well with bodyline. And definitely you will love those small golden turn indicator lights placed at rear suspensions, ofcourse they also have engraving upon them. 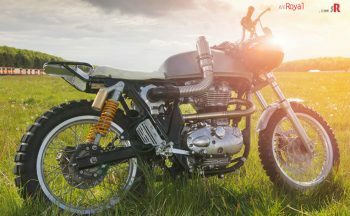 Meanwhile if you have any comment or query related to this bike and this article, you can always use the comment box below. I would say inspired from it but its far better .